Share "Protecting Interior Surfaces While Painting"
For obvious reasons, having your couch under a dripping paint bush may not be the best idea. 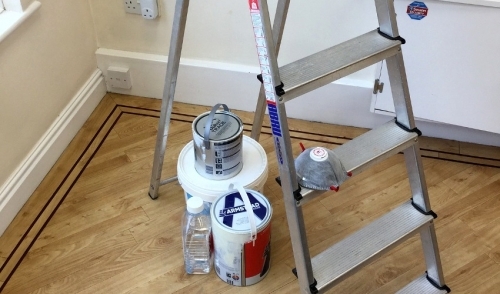 To make your painting as easy as possible, be sure to move everything to the middle of the floor. After you have moved your furniture, it’s time to cover your floor. Newspaper works really well or if you have plastic sheets lying around, they will work well also. For this task you will need some painter’s tape. You can also use masking tape but the painter’s tape seems to come off a little easier. Be sure to cover everything. This includes: outlets, door handles, light fixtures, windows, etc. Also, if you’re not planning on painting your ceiling, be sure to cover that, even if it is seemingly the same shade. Rollers may leave very visible marks on your ceiling, not to mention it will look strange if there is worn paint in one place and not in the other. Make sure you’re covered up as well. Even the neatest painters get paint flying every once in a while.